Journey to the sun with a space-faring holy order, a drunken pilot and the young teen caught between them. Bartholomew hasn't had a lot of life experience. 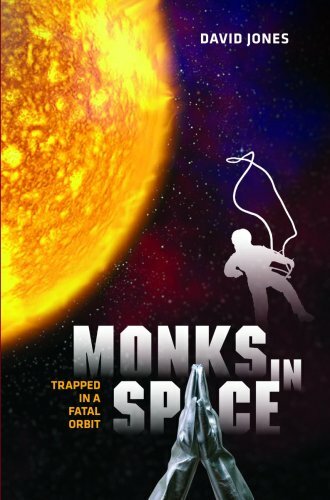 As a novice monk aboard the spaceship monastery Prominence, he spends his days in worship and creating exquisite sun-fired pottery. These trips to the sun are the only life Bart has known. Then, while training to be a pilot with Gary, the ship's hard-drinking captain, Bart hears tales of life beyond the bulkheads. Life is quiet until, one fateful trip, Bart is plunged into more trouble than he's ever known. Two rescued castaways turn out to be interstellar thieves. A cleaning of the ship's bilge leads to a shocking encounter with a giant eel. And then, disaster: when the Prominence reaches the closest point in its orbit around the sun, the engines fail. With only hours before the ship incinerates, Gary devises a plan, but it will save just a few of the ship's 70 occupants. As temperatures and emotions soar, Bart heads into space, risking everything to save them all. Monks in Space is filled with zero-gravity action, memorable characters and mounting anxiety as the end of hope draws near. Readers will thrill to this electrifying adventure.